Dr. Weeks’ Comment: The flu shot is not good medicine. Last year, just like every other year, the well-propagandized talking heads on TV and radio repeated over and over again how important it was to be fully vaccinated with the newest untried and unproven-for-effectiveness influenza vaccine, whose ingredients had been chosen 6 months earlier (In the spring months prior to the flu shot campaign) by industry “experts” who were forced to guess which 3 or 4 influenza viruses from the southern hemisphere (out of 200 potential viruses that can cause “influenza-like illnesses”) that were deemed to most likely to be circulating in the northern hemisphere by the next “flu season”. Six months is the minimum amount of time that it takes multinational vaccine corporations to grow enough of the viruses in fertilized chicken eggs to fulfill the anticipated demand for flu vaccines in the fall. Such a guesswork process is actually a crapshoot and the choices made are highly unlikely to match the new viral culprits that may or may not be circulating up north later that year. I suppose the vaccine industries in the southern hemisphere look at America’s flu statistics when they choose their vaccine ingredients for their next flu season. Only about 1% of Americans that submitted to flu shots in 2017 theoretically received any benefit from the shots, but 100% of them risked suffering the many potential side effects of the vaccinations. Most important among the adverse effects were those often unrecognized toxicity from the neurotoxic, immunotoxic and kidney toxic mercury preservative (thimerosal) that is still in the multidose vials. What happens to patients who simultaneously received their pneumovax shots (that contains aluminum, which is toxic to nerves, toxic to the blood-brain barrier, potentially carcinogenic and also toxic to the immune system) will never be investigated in the US because there is a 1986 Reagan-era federal law that forbids lawsuits to be filed against vaccine manufacturers when their vaccines cause sickness, disability or even death. Hence there is no impetus to find out about such inconvenient facts. So, since there was a vague suspicion on the part of the public about the many failed flu shot campaigns of the past, the CDC and Big Pharma statisticians felt that they had to do something to convince the duped masses that they hadn’t wasted their time, mind, money and health by submitting to the vaccine. In a often corrupted capitalist nation such as outs, where the stock market is king and the public health is secondary, the highly profitable annual flu vaccination campaigns have to be perpetuated or else the share prices (and the honor) of the involved pharma and medical corporations – and the portfolios of many billionaire investors – might suffer. And so, in the face of another failed flu shot campaign, the corporate entities that profit from over-vaccination agendas tried to save face by retrospectively claiming that there was a “60% effectiveness rate” for flu shot recipients last year. Exposing again the truth of Twain’s “lies, damn lies and statistics”, last year’s flu shots actually failed to protect 99% of vaccine recipients. In other words, the ARR for those who took the flu shot last year was 1%, a pretty dismal figure. 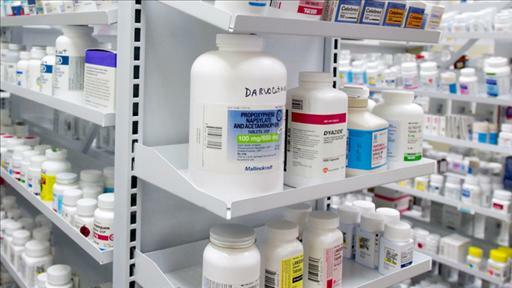 Both the CDC and Big Pharma are notorious for using deceptive statistics which drastically over-emphasize meager benefits and simultaneously under-report (or even fail to report) serious adverse effects or serious lack of effectiveness. What they are doing is bamboozlement at its most sophisticated – and diabolical. If another group of 100 people get the flu shot and 3 of them still get the flu that is an incidence of 3%. Following the statistical rules for RRR, one divides the 3% incidence by 5% and gets a relative effective rate of 60%. But of course to calculate the absolute risk reduction, one divides 95% by 97% and obtains an ARR of 1%, which means that the number to treat (NNT – or number to vaccinate, NNV, which is the inverse of AAR) is 100. An NNT of 100 means that 100 people will have to be treated for one to benefit from the treatment. The very low absolute risk reduction reflects the low probability of getting colon cancer in the first place (only 1 case for every 5000 people per year); by reporting only the intentionally deceptive relative risk reduction greatly exaggerates the effectiveness of the treatment or preventiion. In other words a preventive program advertised to reduce the “relative” risk of getting colon cancer drug actually only prevents 2 cases of colon cancer if you treat 10,000 people. One can see how easy it is to deceive readers by inflating the success of a drug or vaccine treatment by only mentioning the RRR of 50% when in absolute terms the “success” is actually a useless 1%. Which is a damned lie. 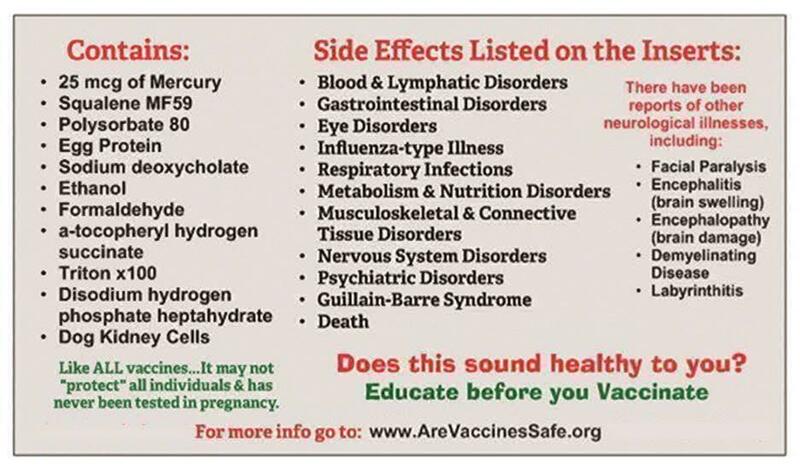 As usual, no calculation is applied to the side effects or adverse reactions of vaccination, which may be substantial. One of the world’s experts on the risks and follies of America’s over-vaccination agenda is board-certified nephrologist Dr Suzanne Humphries. Dr Humphries personally treated three previously healthy middle-aged patients who nearly simultaneously developed kidney failure soon after receiving their mercury-containing flu shots. The patients all swore that they had been perfectly healthy prior to getting the flu shots. Two of the three patients needed dialysis, one of them had a kidney transplant and one died. Dr Humphries, who actually listened to the patients (as opposed to all the other physicians involved in their care) was actually ostracized and censored by her hospital’s staff leadership when she pointed out the obvious connections and the fact that the three patients were suffering from iatrogenic diseases – a taboo subject in all clinics and hospitals. She was so demoralized by her colleagues’ attitudes and soon thereafter left her nephrology practice to thoroughly research the history and (pseudo-) science of the world’s increasingly over-vaccination agendas. Dr Humphries’ first and most important book on the subject is titled “Dissolving Illusions: Disease, Vaccines, and the Forgotten History”. Her co-author was Roman Bystrianyk. Dr Humphries lectures widely on the subject (check out her many informative YouTube lectures), and her testimony has been featured on many important videos, including “VAXXED From Cover-up to Catastrophe”; “Bought: The Hidden Story Behind Vaccines, Big Pharma and Your Food”; “Trace Amounts: Mercury and the Hidden Truth”; “The Greater Good”; and “The Truth About Vaccines”. The following excerpts are from several other authors who have been studying the flaws in America’s over-vaccination programs for far longer than I. They likewise have been essentially ostracized and censored by authorities that tolerate no exposures of truths that might derail their Big Pharma and Big Business gravy trains. The following excerpts come from Alan Cassals, a Canadian drug policy researcher at the University of Victoria, Canada and co-author (with Ray Moynihan) of the powerful Big Medicine/Big Pharma expose that was titled Selling Sickness: Medical Screening and the Misguided Hunt for Disease. Cassals confirms much of what I have written about above. Excerpts below were taken from an article that was written by Cassels. It can be accessed here. Also check out the following Alan Cassels lecture here. How Effective is the Flu Shot? That’s an important question that generates many headlines across North America every fall as the public health community starts ramping up its fall flu campaigns. Problem is, the media tends to generate a lot of noise around that 60% number, but provide very little clarity. Influenza stories this time of year swirl around similar themes, often with the CDC taking center stage (featuring the platitudinous photo-op of the CDC director rolling up his sleeve for the shot), including the importance of the flu shot, the need for general hand hygiene and the expected effectiveness of the vaccine this year. Sixty sounds good, but ultimately is as meaningless as a used car salesman with big bright signs of “60% off” plastered on every car on the lot, without ever telling you what the regular prices are. Despite the potential for a huge bargain on that purchase, the reality is that you’re in for a much smaller deal than you think you are. MUCH smaller. Even when the flu vaccine seems less effective, like in the story that said that “last year the flu shot, by the CDC’s own numbers, was 23% effective,” people might think it’s a good deal. 23% off that Chevy Impala in the back lot might be a great bargain. But what does the 23% or 60% really mean? Since they are relative numbers, they demand us to ask “23% of what?” or “60% of what?” As we’ve made abundantly clear at HealthNewsReview.org, using relative numbers on their own are a statistical no-no because, to quote ourselves, “we think the relative risk number tends to inflate the impression of how much impact the drug [or vaccine] has.” (For a quick refresher on relative numbers check out our review criteria here. I find the 60 or the 23 percent numbers irritating, not to mention epically misleading, and I’m not alone. One commentator looking at a flu study reporting a “23% risk reduction” called it Cockamamie propaganda. Colorful but true. Most people get through the flu just fine and, thankfully, the risk of death or serious illness in otherwise healthy people is rare. In a good year the vaccine might (or might not) protect against influenza A and B, which might make up a small percentage of all circulating viruses. The best way to assess flu trials is to look at those that compared vaccinated people with unvaccinated people. When Jefferson and his colleagues published their February 1, 2018 review at www.cochrane.org, they found that under ideal conditions (when the vaccine actually matches [which rarely happens] the main viruses circulating that season) you need to vaccinate 33 healthy adults to avoid one set of influenza symptoms. This is what we’d call the NNV (Number Needed to Vaccinate) of 33. When the vaccine match isn’t so good as it was last year, the NNV is about 100. Therefore, of 100 people vaccinated, 99 will have no benefit and one person will perhaps avoid one set of influenza symptoms. Vaccination did not seem to reduce the number of people hospitalised or who lost working days. The Cochrane Collaboration is a global independent network of researchers in more than 130 countries who strive to produce credible, accessible health information that is free from commercial sponsorship and other conflicts of illness. They do not take Big Pharma money. Therefore, their studies deserve attention when they are released. On February 1, 2018, the Cochrane group released its latest findings on the flu vaccine. (1) The scientists studied randomized, controlled trials comparing the flu vaccine with placebo or no intervention. They included 52 clinical trials of over 80,000 people assessing the safety and effectiveness of flu vaccines in healthy adults. The studies were conducted between 1969 and 2009. The authors found that flu vaccines probably reduced influenzas in healthy adults from 2.3% without vaccination to 0.9% with. That means that the difference between the vaccinated and the unvaccinated is 1.4% or 0.014. Therefore, 71 people would need to be treated with the flu vaccine to prevent one case (1/1.4%). In other words, the flu vaccine did nothing for 70 out of 71 who received it. That means this study found the flu vaccine failed 99% (70/71). There was more bad news for the flu vaccine in this study. The flu vaccine is touted as decreasing the risk of hospitalizations from the flu. I’m not sure how that happens since the vaccine has never been shown to be very effective against preventing the flu. In this study they found the risk of hospitalization in those that received the flu vaccine declined from 14.7% to 14.1%. That is a 0.6% decline. That means the flu vaccine fails over 99% (165/166) in preventing hospitalizations. Furthermore, the independent researchers found the flu vaccine “…may lead to little or no reduction in days off work.” To make matter worse, the flu vaccine was shown to cause an increase in fever from 1.5% to 2.3%. Oy vey. Why would anyone get a flu vaccine when it fails 99% who receive it? Why would any physician prescribe a therapy, which is associated with serious adverse effects, that fails 99% who receive it? Why are health care workers forced to receive a flu vaccine when it is consistently shown to fail nearly 99% who get them? And, there is not a single well-done study showing that vaccinating health care workers with the flu vaccine protects against the spread of flu. Folks, the flu vaccine is a disaster…I cannot understand why anyone would allow themselves to be injected with a failed flu vaccine. This article was originally published at the Duluth Reader. I forget… Is San Antonio still in America?